The Democratic National Convention is coming to town — Denver, Colorado, that is — and local brewers are turning patriotic. 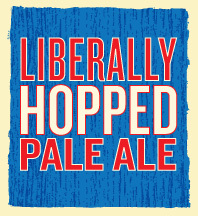 Great Divide Brewing is releasing a single batch of Liberally Hopped American Pale Ale to salute the DNC. This historic occasion calls for an equally memorable beer, and Liberally Hopped American Pale Ale easily rises to the challenge. This medium-bodied, light copper-colored beer features a truly empowering combination of Pacific Northwest hops to complement its all-American malts and ale yeast. Its moderate hop bitterness and refreshingly piney hop flavor and aroma come together with a smooth and subtle malt character to create a superbly balanced American-style pale ale. At 6.1% alcohol by volume, this classic American-style pale ale will appeal to a broad coalition of palates, and pairs well with an equally diverse array of cuisines. Liberally Hopped American Pale Ale will be available on draft only and for a very limited time at local bars and the Great Divide Tap Room.